W.e.f. 25th April 2018, winning the 60-day challenge will not entail brokerage refunds. Digital winner certificates will continue to be issued. We’ve been running the Zerodha 60-Day Challenge successfully for the last few years now. We were the first and still the only brokerage in India to run such a challenge to recognize and reward the hardworking trading community. The idea of the challenge is to keep you more focused on winning rather than just trading, and at the same time bring the fun back into it. This year the challenge is getting bigger and better! Not only are we going to reverse brokerage for winners of the challenge, we will also give them opportunities at becoming star traders on OpenTrade. The challenge is to trade profitably over 60 trading days. You can login to your Backoffice and you will see 3 challenges: Equity, Commodity and Currency. By Equity we mean, Equity and F&O. Once you click start, over the next 60 trading days if you are net profitable, you are declared as a winner. By “net profitable” we mean profits after paying all brokerage, taxes and other charges. How to Start the challenge? Click here for a brief on Q if you haven’t already figured out everything about Q and Quant. How are Trading Days considered? When you click on start, that day will be considered as your first day, it doesn’t matter what time of the day you click start, morning or night. If the day you click start is a holiday, the next working day will be considered as your first trading day. Do note that by 60 trading days, we mean days on which the markets are open for trading. So 1 week will have 5 equity trading days, 5 commodity trading days and 5 currency trading days. If there is a market or segment holiday in between, that day won’t be counted as a trading day. What do you get as a Winner? Each and every winner of the 60 – Day Challenge gets a mention on our Winner’s page with his photo and also a badge saying how many times the challenge has been won. Go ahead and show off to your friends and family by sharing your winner’s page on social media. 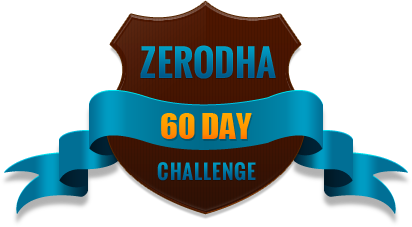 All winners will be emailed a certificate from Zerodha acknowledging your success in the 60-Day Challenge. You can print this and put it up on your wall as a memorabilia. Additionally, if you authorise us, we would share a brief profile of yours on our website which gets lakhs of unique visitors every month and on our Facebook page which has over 50000 likes. As a consistent winner, you would also get an unbelievable chance to get featured as a Star Trader on OpenTrade, India’s first and only social trading app which allows you to publish your trades real-time and garner followers. If you have a good track record as a trader, you could have many followers who will pay to view your market action. Last but not the least, you can claim your brokerage reversal for the 60-day challenge period by logging into https://q.zerodha.com as shown in the image below. We have capped the maximum brokerage reversal at Rs. 6000/- for winners. To be considered as a winner, you need to have been actively trading during the challenge. Cases where clients have stopped trading completely after making a small profit won’t be considered. Brokerage refund is applicable only for individuals. Non-individual/algo-trading clients are allowed to take part but will not be refunded. How does it workout for Zerodha? Our business revolves around word-of-mouth advertising and keeping you profitable is a key to it. As we have seen in our earlier challenges, the profitability of contestants during the challenge shoots up considerably, and a profitable you would probably mean that you will refer more people to the business. Finally, today if you want to set up a cricket team, you can visit 20 cricket grounds, spot the talent and you can set up a pretty decent team. But what if someone wants to set up a trading team? Trading, similar to sports and arts, requires the person to have an inborn talent and is very tough to spot as everyone is trading on their own online. For all of you talented traders who wish to be professional traders, we see a business model being a scout, connecting you to the world of prop shops and hedge funds who are continuously looking for traders with skills. Check out the discussion threads for Equity, Commodity and Currency under the section “Zerodha 60-Day Challenge” for all of you to share your views on the market, trading ideas, strategies and any others which can benefit our trading community. I hope that you like this program and I wish you all the best! When Clicking ion Start. its Giving a pop-up as Access Restricted…. When you click on start, that day will be considered as your first day, doesn’t matter what time of the day you click start morning or night. If the day you click start is a holiday, the next working day will be considered as your first trading day. Do note that by 60 trading days, we mean days on which the markets are open for trading. So 1 week will have 5 equity trading days, 6 commodity trading days and 5 currency trading days. In this challenge, how many days we have to active and suppose sometimes i made a loss than i recover it and i did net profit. so it valid. Mohit, as long as on the 60th trading day you have made profits, you are considered as a winner. It doesn’t matter what you did during the 60 days. I am yashoda from Hyderabad. I was the successful winner in the 60 day challenge. On 02-02-18 it was completed. Every day saying you will receive today when I call them and when I mail them.ticket number #477094. Nithin sir kindly respond to day 17th Feb.
Could you please clarify as to why in the P& L report generated in the 60 Day Challenge when the share goes ex dividend, the dividend income is not included in the “Realized Profit”? Kinnari, we don’t capture dividends on Q, and hence can’t really be used for 60 day P&L. Also we have made a small change for equity, only trades executed within the period will be considered for the challenge. Will it consider only the realized profit on the 60th day OR combines the Unrealized profit too? I don’t wish to square off to realize profits. What should I do in this case? We take into consideration only the trades executed during the challenge. The unrealized profits won’t be considered. I am a big fan and supporter of Zerodha platform, i have recommended Zerodha to all my colleague, they are also happy with it. But the 60 day challenge refund should have been there, it attracts people to trade and encourage us to make more trade for winning. Please consider activating it back. Navnath, the reason for stopping this wasn’t the revenue, but compliance. The exchanges don’t encourage any schemes/offers like this. Net profitable means everyday in profit or last of day of 60 days total will be in profit. really fantastic, but do continue this challenge without any break. Thank you Nithin. Is there any last date before which we need to activate the challenge in order to participate in it? Or we can also activate it after one month also. Also, if we are permitted to start the challenge after say 1 month sometime in the month of May, then the validity of the contest will be counted as 60 trading days from when we start the contest? Kalyan, you can start the challenge anytime you want before Aug 15th 2013. From the day you click start, 60 trading days from then would be counted. The only good thing with starting the challenge right away is that you will have an opportunity to take 60 day challenge twice before Aug 15th 2013. Hope this clarifies. There is no rank, if you are a winner you get a brokerage refund, we send you a certificate, and display that you are among our profitable traders on the webpage. Can you send an email to [email protected], he will give you details. Hi, I am interested and want to activate the same. But after logging in Zerodha backoffice I can see the link to “START” the challenge, But when I click on it it shows error “access restricted”. Please provide solution how to activate in NSE equity and F&) challenge? Click on start next to equity and derivatives. It will start working by 2pm. Cheers..
What if a client wants to participate in the Zerodha Challenge., But he does have some positions which he don’t want to squreoff., How will be the calculations done in that concern., What about the payin/payout during the 60day challenge.? From the day you click on start and over the next 60 trading days, all your trades is what is considered for your profitability. The funds you have transferred in or withdrawn won’t make a difference. On the last day of the challenge if you are holding any position, the profitability will be calculated by looking at the closing price of the stock/future/option on that day. 1: One should be profitable in EQ & FO::::: Does this means one should have profit in his holdings (delivery ) instrument and also on F&O position, OR Does this means delivery and FO profit / loss will be added and if both sum comes profit then win else loose. 2: Consider one have profit in his option instruments in his challenge’s last day, however on last day he did some trading where he is about to get loss and if he realized the loss he will loose the challenge, so one decide not to Square off the position, in this scenario how you guys will confirm if he won or loose ?? 1. We don’t check holdings. You need to profitable across all trades executed within this period. 2. It is just P&L for 60 day period, sum of all realized+unrealized in case of F&O. Only realized in case of equity. I have logged in but there is no window showing take zerodha 60 days challenge. The link will be up before the market closing today, you can login and click start after that. Just stumbled upon it while visiting the backoffice & i’ve clicked on satrt… so probably today counts for me. Good to see the Zerodha challenge back finally… bigger & better! As mentioned above, your funds transfer and withdrawal has nothing to do with it. If your net profitable after considering all the trades during the period, you are a winner. On the last day if you are holding any position, the profitability will be considered based on the closing price of your holdings on the 60th day. No conditions at all, you could have just done one trade or 1000 during this period, if you are net profitable the brokerage will be refunded for that period. Are you sure? Say i still have 24 days to go. At present i m in profit of very small amount (lately able to recovered my losses made in last 36 sessions) now if i stopped trading till my challenge day completes. Will i get my brokerage refund? Yes, your brokerage will be refunded as long as you’re profitable within that 60 day period. but one problem i am not able to see the pop up this start button for this challenge activation purpose…..
You have to delete all your browsing history and you will be able to see the start button. Open a new internet explorer window, under tools you will see internet options. Click on internet options and you will see browsing history. Under browsing history, click on delete browsing history on exit and click delete. Close your internet explorer and login, you should see the start button and click it. I see a button after logging in saying “TAKE THE ZERODHA 60 DAY CHALLENGE!”, but it doesnt respond when i tried to click on it. Please help me! You have to delete all your browsing history and you will be able to see the start button. Open a new internet explorer window, under tools you will see internet options. Click on internet options and you will see browsing history. Under browsing history, click on delete browsing history on exit and click delete. Close your internet explorer, open a new internet explorer window and login to BO. Once logged in, you will see the 60 day challenge and the link to start. 1) When i take 60 day challenge,do trading only for few trading days & make some profit after all the charges & brokerage paid, will i get refund of brokerage paid? 2) For example if i had paid the following charges by end of 60 days 1. brokerage paid is Rs 1000/- 2. STT rs 800 , 3. Turnover charges Rs 1500 etc , if i’m a winner i will get only the brokerage paid i.e RS 1000 right? Yes you can trade only for 1 day in the 60 day period and if you are in profits you will get back the brokerage. There is no conditions to this. Yes only the brokerage of Rs 1000 is refunded. WILL I GET THE ENTIRE 10,000 refund? Your turnover or how much money in your account has nothing to do with it. If during the 60 trading days, you are net profitable(which means after paying all taxes, brokerage and other charges) you are a winner. So if during the 60 days if your net profit is Rs 1000 and the brokerage paid is Rs 10000 during the period, the entire Rs 10000 is refunded. hey zerodha , i couldnot activate the 60 days challenge even after deleting browser history ..
can it be activated by calling you..?. For the challenge we will consider the closing value of positions that you hold on the 60th trading day. So if you have an MTM loss of Rs 2500, it will be debited from your account’s profitability which is Rs 2000 and you would have ended the challenge with a Rs 500 loss and hence not a winner. You will not be eligible for the refund.. The video says that you can a chance to work as trader with Zerodha (citrus paribus)…..what goes into this selection process? is there any transparency on this…so that it gives us the outlines to follow if w are gunning for this position??? How to start the challenge from Zerodha Trader? Or else Do I have to start the challenge online only? If started online and traded through Zerodha Trader, will it be consider as active participation? Very good initiative frm Zerodha 🙂 Rock n Roll !!! Zerodha is here to stay, so i opened account with you guys! 1. Will there be any ranking of winners? 2. I am only participating in commodities. Is it OK? I mean will there be separate list of winner for all three segments? No ranking of winners, everyone who makes money is a winner. Yes you can participate only in commodities, completely alright. Yes winners will be separate for all the 3 challenges..
I’ve been trading in stock market from 2008 Jan, started in 1st year while studying engineering. I’ve read more books on stock market than my engineering degree and also managed 5lac amount of my clients money with over 15% profit per trade . Its my passion to be part of stock market, but unfortunately I’ve end up in IT sector and working in an MNC. But I couldn’t resist myself in a IT cubicle, All i want is to work as stock broker/technical analyst but no brokerage house recognize my talent and not ready to offer me Job in this sector. I admire zerodha and its CEO Nitin. I take up this 60 day challenge and prove myself to be part of zerodha team. Very good effort. I like it. so, after 60 days i made profit 1 rupees, i am the winner. Yes dtrade Rs 1 profit after all taxes and charges..
sir when i observe one thing in “common profit loss view”………….. in that window we observe all are separate taxes and brokerage so on… and net value so i calculate my netvalue subtract all those taxes …… are as it is same what ever it shows in that window…. sir………. actually some mistake in our zerodha window that is it shows “other charges” instead of “Net value” Yesterday in Equity and derivative segment …. thats why i ask the above question…. Gross Value , Net Value and Other Charges three things are shows Wrong Places in that performance window ………. Zerodha-60 day Challenge is very nice! I was trading from couple of years so this is very good challenge for me to check my efficienty of my trades. Thanks zerodha for introduction this concept. No kinjhoh, your trading has to be profitable , referral amount , money transferred in , withdrawn nothing will matter or be considered..
Ive started the challenge today evening..so will the trades I took today be counted. Hi..got the answer after reading above..just overexcited about the challenge!!! In my backoffice home page the link for 60 Day Challenge in yellow color is disable. Please help, I want to take the challenge. I am Manjunath. I am trading on behalf of my friend Prashanth S (Id RP0429) from my terminal. In case I am a winner, the certificate is going to be in Prashanth’s name is it? Regarding the interview for selecting the trader, how can I be called as the winner is going to be Prashanth? Certificate would be in the name of the account holder but if the account holder authorizes we would consider. What is other charges being shown at the right bottom corner of status tracking window for 60-day challenge ? Wouldn’t that be better, if each participant can see his daily ranking in the aforesaid NetValue tracking window ? If he stands loser in one segment and winner in another segment then how is overall performance/Netvalue calculated ? Can we get a composite NetValue record for the same ? If you visit our brokerage calculator you will see all charges, other charges would be call n trade charges or any exchange penalties etc. These are 3 different challenges. If you win the equity and f&O, you will get back all the brokerage you have paid for that .. if you lose commodity, you will not get back the refund for that.. simple.. Yes we will have that issue fixed, NSE, BSE and MCX-SX will all show as one for equity and derivatives..
we should know the competitors position in the RACE ? It will definitely urge competitors for making maximum profits with lesser risk. It is a challenge, where you are pushing yourself to do the right things with the goal of staying profitable. Winning is a habit and we are trying ways to assist you get there.. Yes Vijay, the day you start the challenge closing price of the open position the previous day will be taken as a reference point. Nitinji it means per trade per profit. 1 trade or more trade in 60 days. Is it right sir ? Profit of all trades done during the 60 days. i had activated the 60 days challenge on 4/4/2013…. i clicked the menu button and it is not showing the track nperformance…. has the stt change not been implemented ? what has the reason been ?? 60 day trading challenge means v do all 60 days trading from 1 to 60? or in 60days it is our wish to trade. Ram, no restrictions, you can trade only once or trade on all 60 days, the choice is yours. There is a small issue with other charges, it ideally should show only call n trade or penalties, but right now it is showing a different number, will be fixed in a while. Ex: i started with 1000 and end of 60days i carry 1010 ..will i be a winner ? Or are there any best of the best too happening? Can i place a withdrawal in btw 60 days ? Suppose at 1st day i had zero balance and then at 5th day i invest 5k for trading ..would it be ok ? Any idea about STT and CTT implementation ?? Would it be implied during 60 day challenge ? Thanks for sharing your feedback. We’ll look into this and have it rectified asap. Today pick of stocks is FRL. After starting the 60 days challenge, I sold positions that I’ve been carrying for long time and now there is a difference of 750 stocks b/w buy qty and sell qty, I wanted to clarify even if there is difference in buy and sell qty and net profit is +ve, Will I be considered a winner? The 60-day challenge is quite simple actually. Whatever positions you held before the start of the challenge will not be considered. Your profitability will be considered only for positions that have been taken during the challenge. I hope this clarifies. i registered myself as partcipant today at 5.00 pm in cash/f&o segment ,today my trading day was profitable. my quetion is :will today considered as 1st day ? if yes then, why are statement not showing today’s status? You will be able to see it only after the trade process for the day is completed. Does profit calculation includes the Rs 20+20 Zerodha brokerage charges with other gov. charges (ST, STT, turnover charges..etc) or only Gov. chrges? Yes, profit calculation includes all the charges brokerage and guv charges. M i required to trade on all trading sessions falling in those 60 days to be eligible to be held as a winner???? You are not required to trade on all 60 days, if you have done 1 trade which has made money in those 60 days, you will get the refund at the end of the 60 day challenge. Very encouraging Program takenup by Zerodha…giving lowest possible brokerage charges 4 traders…n daily trying to give new upgradations in software…Glad 2 b a Zerodha trader…It vl b a surprise addition to d account after 60 days…all brokerage charges deducted in dese 60 days….Sure..vl try n get my brokerages back…by being in profit after 60 days!! Gr8 going…just started 2 days back…n in profit as of now…sure good thing 4 traders!! @ Srinivasan i agree your point…. 🙂 but Technical Analysis will give only 70% Accuracy… so can’t depend on Technical Analysis also…. Hey i feel Alogz is very cool so did you try that Algoz Trading..?? Is the only 60th day MTM count or you will count all total MTM till 60th Day from the start of the challenge. If I win the Challenge when I will get the brokerages, mean how much time it will take to credit the amount. Gautam, basically all trades done in the 60 days and the MTM on your open positions as on the 60th day. The brokerage credit will happen to your trading account within 2 weeks from when the challenge ends. I have started zerodha 60 day challenge on 23-may-2013 and when i calculated trading days left till 15-aug-2013 is 59 and if NSE does not organise special trading on saturdays then i will be able to trade for 59 days only. Should I am considered for zerodha 60 day challenge or not please clear my doubt. It doesn’t matter even if 15th aug is your 59th day, your 60 day challenge would then end on 17th aug then. It doesn’t matter if your 60 day doesn’t end before 15th Aug.. You are still considered.. I had a doubt. I choose Equity and Derivatives for 60 day challenge. I had made loss in Equity cash say for example 15000 Rs., but i made profit of Rs. 20000 in options. So my ledger initial opening balance is 10000 and due to the profit it is now @ 15000 which is a addition of 5000 Rs. At this scenario did i win the challenge to get the brokerage (of both Cash & option) refund. or will i get only of the option brokerage. Or did i failed in the challenge. You will be a winner for the equity challenge, because we look at combined profits of equity and f&O.. I have just completed my 60 days challenge in commodity. How can I see the results? What is that “evaluate” option in 60 Day Challenge Banner? In Commodity it shows “Start” option, so shall I start the new challenge again from today itself. 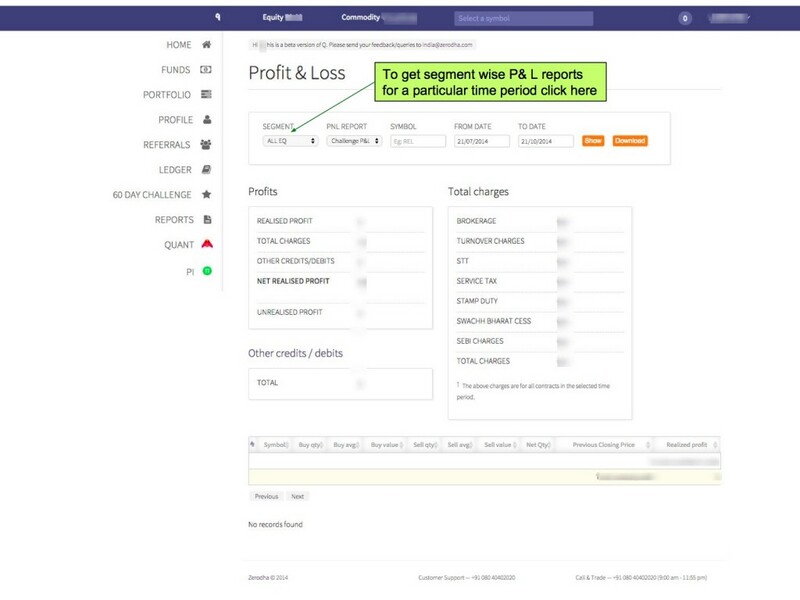 Evaluate will show all details of the last challenge, if you have made profits it will also show you a claim button and if you click on it, the brokerage will be refunded. If you haven’t made profits, you will not see the claim button. Yes you can click on start and the next 60 day challenge would start. This is my 60 days challenge report in MCX? Should I get back my brokerages after this? If yes then how can I claim them, as there is no button like “claim” in that window. Sorry had missed your query, you will be able to see the claim only once the 60 trading days is complete. I guess you would have seen it now and congrats on winning the challenge and staying profitable. I have claimed my refund amount three times , but still now I wont get anything. Why so? My zerodha 60 days challenge will end on 28-06-13 . I want to start new challenge on 1st July but there are only 34 trading days before August 15. In this case will I be considered for the challenge ? At the end of the 34 th day if my net profit is +ve, will I be considered a winner and brokerage will be refunded ? From July 1st you will be allowed to complete the challenge in 60 trading days. From Aug 15th you cannot take a fresh challenge. But if you click on july 1st, your challenge starts from the 1st and for the next 60 trading days. I will be starting to trade today so will it be possible for me to complete the 60 day challenge considering it ends mid August!! My 60-days was over y’day (28th June). I got the “evaluate” button, but , I don’t see the “claim” button anywhere once I press the evaluate. I guess the reason is the Net Value is being shown as 0.00 , though I have made profit. Is this a bug in the software. If so, rectify this soon. Can you send an email to [email protected] with your client id mentioning this issue. I sent a mail. Looks like some issue with the backend. To be sorted out by today evening. Probably next time, we can avoid this “claim” procedure. Automatically, the brokerage can be refunded. I dont think anyone will be against it. Btw, this is a great initiative, which is a win-win situation for traders and brokerage house. Will be spreading the word, hope you get a lot of new customers. same problem with me sent a mail also. Yes Sandy and optixx, issue with the equity challenge for clicking on the claim button. Working fine on the commodity. The tech guys are working on this and should be fixed by end of the day today. Looks like the issue is still not resolved. The calculations were working on a day-to-day basis very well during the challenge. We were able to see the net profit and the total brokerage. The issue is only with the “evaluate” thing. Can you not bypass this “evaluate” and “claim” stuff? Facing some issue with the equity window, should be fixed by end of the day today.. Seems like taking more time to fix this. You have the data with you. Can we not make it automatic. I am not sure why you are pressing for getting the claim ( getting refund). I would rather say not to ask for refund. Let Zerodha keep the money they have EARNED. Even I am the winner of challenge ( I have made 900% profit) and I have ask them not to refund. Please Respect other’s earnings. It is perfectly alright to claim for the refund. There is a business strategy around what we are doing and we will share with you in the future. But for now, Ashish do claim for the refund, we will send you a beautiful certificate also acknowledging that you are a winner. We will also send out a testimonial form and we will appreciate if you can write and put up a photo. We want the trading community to know that there are winners in the business of trading. People need a motivation to stay in the business and all of you winners will be the motivation. Firstly congratulations on winning Zerodha’s 60 day challenge. The restart module has been set right. You will now be able to restart the challenge. At the same time to Evaluate your performance, please click on the Evaluate button and view your results Cost Center wise..You will get the Claim Button in case you have been profitable..Click on claim and it will come as a request to us and we will initiate suitable actions to refund your brokerage, should take a maximum of 2 weeks. Please let keep Zerodha the brokerage they have EARNED. Please do not claim it if your winner of 60 days challenge. We will also send out a testimonial form and we will appreciate if you can write and put up a photo. We want the trading community to know that there are winners in the business of trading. People need a motivation to stay in the business and all of you winners will be the motivation and a target for other traders to get to. We are hoping with this challenge to remind all our traders that we are all in this business to trade for profits and not just for the heck of it. So does that mean only after claiming we will get a certificate? if Yes then I would claim; But thing is I am not aware of procedure. When logged into backoffice, I am seeing -2 days against Equity &FO ( my 60 days challenge ) ….. Can you help? Also I want to take challenge for same equity&fo for second time. And there is no way I can do that currently. Give time till end of the day, you will get option both to claim and restart again. So do one thing… as you won the brokerage challenge, don’t claim your brokerage. Instead send a mail to Zerodha and asked them to provide ONLY the certificate. Can you do that ?. When you enter any competition, before entering you should know what is the outcome . After winning the competition if you say i don’t want the prize that is like insulting the competition. Can you help me with your client id? How do I ask new questions/queries? Is there an option like ask new questions or new post? It feels odd if my question/query is no way related to current post..
You can ask your question in the respective blog. You can see the categories on the right side of this page, almost every aspect of our business is covered in those. You could also use the search option for this. I understand. Point I tried to made was that we can not start new topic or question..
Must we ask questions as a comment to some (possibly !?! ) unrelated article/post? Oops!! made silly typo..Sorry!! there is no way to update the post/comment hence new comment….. I understand. Point I tried to make was that we can not start new topic or question..
You surely can drop it in the office there. You can also find the local contact number in Ahmedabad on our website. Yes you can start a new question, no need to ask in an unrelated post. Last month you have mentioned that more than 4000 ppl have started the challenge. Am sure, that the list will grow till 6000 or so by Aug 15th (discounting same ppl starting twice). Do you have plans to publish all the names of those who were profitable at the end of the challenge in your website? Or just a select few? We will be publishing only those who agree for us to display the names. But yes, we will publish and share on our FB and social media. It is important for everyone to know that there are traders out there making money. I am yet to recieve Certificate or Brokerage return although I have hit the claim button on 5th July 2013. Upon dropping a mail to customer care, they have replied that brokerage will be refunded starting from Aug 2013. I am confused right now. Just need one clarification on the brokerage returns. How will the proft & loss statement get affected by the brokerage returns. Assuming, the brokerage for this financial year is 25K, the returned brokerage was 10K, will the profit & loss statement have the value as 25K / 15 K? Will the amount be credited to the associated bank a/c directly? OR will it be added to the trading margin? When can we expect the credit to happen? The brokerage will be credited to your trading account. Will show on the books as a brokerage refund. Credits should happen from tomorrow, we will be sending out the certificates today and also some information that will help us and fellow traders. I completed 60 day challenge on 28th June successfully taking my equity account to the maximum on the final day of 28th June. By when can I get the certificate for the same ? My associated email id with this account is same as the one which is associated with my Trading ID. So please have a look into my performance. I am also sending a separate email with excel attachment showing the equity curve and Daily/weekly/Monthly profit/Loss Report. Please have a look and let me know if you see me as a potential trader to be hired by your firm. Just replied to your email, we will call and discuss with you on this soon. i got positive net profit in Commodities, have not yet received the brok. Did you get the certificates? If you haven’t yet can you email [email protected] , we have a lot of winners and doing this job one by one. If you send the email out, it will happen faster. I guess there is lack of clarity of when the brokerage will be returned. Being specific can help. I have a few questions regarding Zerodha 60 day challenge. 1> I have started my challenge on 29th july will it end on 15th August as mentioned or it will end when i finish 60 days..? Kindly through some more light on this topic. Your guidance would be of great help as i’m looking forward to moving into full time trading. 1. Your challenge will end 60 trading days after 29th July and not on 15th aug.
2. You can consider this as a first round screener, it is not absolute returns but what we are looking for is people who show discipline in their trading and also stay profitable. Discipline in terms of strategy and risk management. It will be in the A/c holder’s name. During the 60 days challenge, we are able to check the net value in the back end system. But is there a way to calculate the percentage returns we made? i.e. I would like to know how much did i earn/lose in percentage wise? is there a possibility to check our % returns? %return is tough to calculate because the fund status can keep changing, you can be adding or removing funds. There is also MTM to worry about.. So there is no way one can find how much returns a person made after 60 days challenge?? In the evaluation page of the 60 day challenge, you can see the net amount which basically shows how much you are up or down by. After completion of 60 Days, How many days it will take to get back the brokerage refund in my account? Is it immediate or will take some time. It can take upto 2 weeks. yesterday on 28/08 60 days challenge completed. can i go for another one? Yes you can, go to the backoffice and you will have an option to start the next one. Its 3 weeks over still i have not received any refund or any certificate or any intimation about it. Can you please tell me how much time it will take? There was some issue with the equity based challenge. You should have it credited this week. i completed my first 60 day challenge on 14/08/2013 but till day my brokerage for nse futures is not refunded after completing it in profit . even certificate is not received by me . i have even sent an email to vishal two days back but no reply. i hope my query will be answered at the earliest . Email has to be sent to [email protected] , Will have Vinay check this out and get connected with you. He will get back to you on this. Good news that the zero brokerage challenge is extended till Dec 31. I am on the second challenge and will get over by month end. Can I start the challenge for the third time immediately? This is good stuff. Kudos to you guys for persisting with this initiative. If one is in profit in Equity and loss in Equity Futures, and the profit is more than loss, howmuch Brokerage willbe reffunded. Will you refund the total brokerage of Equity and Equity Futures or only Equity. We will refund for both equity and equity futures together. What happens if I sell my long term holding which bought earlier and sold during challenge period ? For example I bought X company shares before @100 and sold @200 during challenge period. If at end of challenge period X share value is 400, I am a looser or winner ? At the start of the challenge we will have a value for your long term holding and the profitability of this trade would be considered based on the holding price on the 1st day of challenge.. But, your software calculated in other way. Suppose if I buy shares before challenge period @ 100 and sold @ 200 during the challenge. If the value at 60th day of challenge is 400. Software is calculated like bought @400 and sold @200 and loss=200. Because of this, backoffice showed my second challenge is on loss, even though I made profit. If you are carrying any equity position into the challenge and are selling it during the challenge, the buy price that will be considered is the price of the stock as on the opening day of the challenge..Would you be able to tell us the stock name where the computation hasn’t happened this way? I am one of the winner in zerodha 60 days challenge. I am looking forward for you offer for the interview for prop Trader. Could you please tell me when are you going to call for the the interview. I consider myself as well experienced trader having potential of making 4 to 10 % per month. Please guide me about the Interview. hi zerodha i completed my first 60 day challenge on 02/08/2013 with increase in proffit over 600% .my initial capital is 65000.00 rs and net value as on 02/08/2013 is 470389.26 rs. naanu claim kooda madiddini adare brok refund aagilla .nanage brokge refund aagutta illa ilva ? The brokerage refund is done in batches.. Please send an email to [email protected] with your client ID to get an update on the status of the refund. Congrats Nag.. tats really awesome profit. I need a small clarification how the winner is selected ? Is it based on amount he earned ? or the growth he got ? for example : when i am started by portfolio is at 20000.00 when my challenge ended i am end up at 120000.00 my growth is around 600 % . We declare the people who make net profits during the challenge as winners, it is based on all the trades you have done. If you are in profits we declare you as a winner, give you a certificate acknowledging and also refund the brokerage. Traders who have consistently made profits while trading, we feature them on the Zconnect section of our website as well. My friend completed the 60 day challenge 2 times(2 Cycles) and started the third one, he have win the first cycle on commodity segment,but he couldn’t claim (otherwise he don’t know if any process for refund this brokerage). It this time we can’t see the first cycle result for claim.What we will do ? Help me please…. Can you send an email with your friends client id to [email protected] and [email protected], we will check and revert. If the claim button is not pressed, we will not get to know if the challenge is complete or not and if a person has won it or not. Me and my friends have enabled the challenge from 27/09/13. In the backend it shows the start date ad 27/09/13 and end date as 25/12/13. The end date should be 26/12/13, since 25th Dec is a trading holiday. My 60 days challenge has been completed on 25th October in which I was in net profit of approx. Rs. 2500. I clicked on claim button to claim the brokerage after the challenge after two days which was showing net profit at that time. The brokerage has not been refunded as of now. Also, I had bought some options on last day of challenge in the last minute of trading which I sold on next trading day in profit. But now when I click on Evaluate button on backend it shows my challenge to be in net loss which was actually in profit even if closing price of option is considered for calculation. Could you update the data and refund the brokerage. Can you send an email out to [email protected] with your client ID. I am not able to understand WHY MY NAME IS NOT APPEARING on the 60 days challenge winners page. I already have two wins in my kitty – one for commodities and one for equities future and options..
Can you please look into this ? i cleared the 60 day challenge for commodities and nse future and options…by mistake i have mentioned equities…anyhow i am two times winner :).. I have completed the zerodha challenge for derivatives successfully, I heard that there are some opportunities in your firm and associated hedge funds for traders, if there is some opportunity, I will be interested in trying for the same and explain my views on trading and the way i trade. My id is DM0430, kindly check, if interested please reach me. Hello Nithin. I recently opened an account and started trading. I have just started the 60 day challenge so wanted to know if the challenge will continue in 2014. I would like to know if I can open an account with Zerodha and take the challenge now or is it too late? What is ur projected date of termination of this challenge. I am looking to grab this opportunity to be a hedge fund trader. Thanks for starting Zerodha. It took 3 years to find that such wonderful concept exist. Thanks to Youtube i say for finding Zerodha. The best thing is the efforts and idea you have put to built a community of practise for traders is very unique and which motivated me to open an account with you. We are heading in the direction that you have suggested. Suppose i tradeonly 1 day during this 60 dy challenge – and i am in profit – will the brokerage refunded?? Brokerage will be refunded to your trading account, you need to click on evaluate and claim on the backoffice. Will get someone to call you back and explain how. HOW MANY TRADES I NEED TO DO EVERYDAY FOR QUALIFYING 60 DAYS CHALLENGE, IS IT OK DAILY 4 – 6 NIFTY OPTIONS TRADES. SAY 1 DAY 1 MADE 6 TRADES AND NEXT DAY ONLY 2… BUT ALL THE 60 DAYS I’M IN MARKET. There are no conditions 🙂 The idea of launching the 60 day challenge was to ensure that whenever our clients traded, they had the thought of being profitable..There are no minimum trades that you’re required to make..
1) For 60 Day challenge, in cash segment, is delivery trades also included or is it only intraday trades? 2) Currently i am doing trades in both F&O as well as Cash segment. Suppose if i complete in profit in one cost centre and loss in another and the profit is higher than the loss, whether the brokerage of both the cost centre (cash and F&O) will be refunded? 1. All kinds of trades are included in the challenge as long as the buy and sell has happened within the 60-day challenge range. 2. Each challenge is treated individually. This means that if you win the Cash challenge, you’ll get a brokerage refund. If you lose the F&O challenge you will not get the F&O refund. There is no connection between the two. Hi Hanan, Wish you a Happy New Year. I am happy with the first answer but with respect to second, the answer is quite confusing. Actually i am speaking about Cash and F&O and both falls under the challenge “EQUITY & DERIVATIVES” and hence they should be treated together. Hi Nitin How can we come to know if we r in net profit .Is it net receivables – (net payable , brokerage fee tran. fee and all other charges). Also how many days it takes to refund the brokerage if we win . If you login to our backoffice(bo.zerodha.com), you will get to see all the options when you click on evaluate on the 60 day challenge box. Once you win, the brokerage refund can take upto 10 days. This 60-day challenge is extended to 31st March 2014. So if someone enables it on 30/31st March, will it be valid for 60 trading days from 31st March? Could you let me know the tax implications of the brokerage return. That amount directly gets added to the profit and we are supposed to pay tax on that rite. It would be good if there is a section on tax / queries. Am sure lot of clients will be interested in knowing about tax, how to set off some profits against expenses etc. We probably have the most popular Post with Q&A when it comes to trading markets in India, check this link. Brokerage is an expense for you that is declared while you are filing your returns, the brokerage refunded just reduces the expense, and you don’t have to pay any tax on this. Download the NCFM workbook for technical analysis, has very nice information on a lot of indicators. I have completed the Equity challenge with positive note 3 weeks before and I evaluated on the same day. But till today I didn’t get any update on this. Can you please let me know the status of it. Pavan, you need to click on claim after evaluating. You can send an email to [email protected] if you have any query on this. I am forwarding your client ID to him. Thanks Nitin… I got my Brokerage back… Really good programe which improves my technical skills. Please start new 60day chalange. We haven’t stopped the 60 day challenge, you can login to the backoffice and start on your own Satyam. i had recently won the 60 day challenge (challenge time period ended on 24-Jun-2014) and i have clicked the claim button (around 28th or 29th) , but still havent received the brokerage refund. Do let me know when i will get it ? You need to login to our new reporting tool Q. We will check this and get back to you by tomorrow. I just opened account and i would like to do 60 day challenge. is there time left.? it is till 30 September. there isn’t 60 trading days left i think. can i join sir.? Akhil, you need to start the challenge before 30th Sept, 60 days will be counted from when you start. Login to Q and start it. If I look at the old backoffice my net value is shown as 10397.866. But in new Q tool, the profit is shown as 380.37. As per my understanding the net value will be considered, right ? Why there is a difference between two values. Revathi, there is a difference in the way profitability is considered for open positions/holdings, Q is the correct way. If you can let me know your client ID and time period for which you are trying to see your profitability, I can have it double checked. Nilesh, net profitability after all charges and taxes. In this case your account would be at Rs 29900 and hence you won’t be a winner. Is this only Brokage refund or related STT and other charge too?? For crowd.in challenge our friends using 600 mail id to win, please allow only 1 id for one ip address. AKS, we need unique mobile numbers, and if someone has 600 unique mobiles/600 email ID, we at the background run the IP address check. We disqualify anyone trying to manipulate. Can I take the 60 day challenge even now? Also, will my current open positions be considered if i take the challenge (have sold nifty options for sept expiry and have have few open stock options). Yep, you can start any day, and your challenge will be considered based on the value of your open position as on the closing price of that day. Thanks Nithin, decent trading platform, low brokerage and find this challenge a pleasing initiative. Exploring Z-connect further, thanks again. Now looking forward for second 60 DAY zerodha challenge..
Congrats, you should be up on this soon. I have won 60 days challenge couple of days back. When will the brokerage amount for the challenge period gets refunded? Will it be credited to my trading account or bank account? Also when certificate will be issued? Can take upto 10 days for the entire process. he can start another 60-Day-Challenge? and can he/she start it after 31-Dec-2014 also (if he/she is currently enrolled into the challenge)? Yes, and yes we are extending the challenge until March 31st 2015. I have been dealing with customer service of many banks and companies they are harsh sometimes and not understanding what I am talking.Only in the case of ICICI bank I am able interact with CEO. You are very humble and simple with customers, I sincerely appreciate you . I made a request to zerodha to code my algorithm*Algotrading) 5 monhs back.There was no redponse. Kindly expedite it to help me make more trades. I am forwarding my algorithm for your reference. It is aresult of 3years hard work. If it is done I will become a billioniore within 3 months. I have written a book “The last wonder-Univeral day trading model”and pubished as e-book throught the world. I am forwarding the book also. Now my fear is your employees may give my algo software to other clients without any benefit for me. I am hesitating to send mail to you for the last 3 months. In that case other trader may obstruct me in my trading. I request you to kindly take action sasfeguarding my interests. I do not mind not getting software for me. Yep, saw your email. We should be able to help you out with this. My guess is you already use a coding/backtesting platform? If you are using one, semi automating/fully automating it on our new platform Pi, will be quite easy. its been 11 working days since i have won the 60 day challenge and 4 days since i have raised complaint to support team yet i didnt get my brokerage refund. please clarify.. I mailed Vinay before 4 days. Yet I didn’t get my refund. It’s been 20 days since I ‘ve won the challenge. Every time I mail I m getting the same reply – it s being processed check u r ledger after 2 days. I m very happy trading with zerodha but in this case I m disappointed. You are not required to trade everyday. You could have just 1 trade in 60 days, and if it makes money, you are a winner. I would like to apply for the role of a professional trader at the Zerodha Prop Desk. I have both won and lost the 60 day challenge in the past but I have acquired the skills required as a trader over the past 2 years. I know I would be an asset to your firm with the knowledge I have gathered, but more than that I want to learn more and work in a team. Please let me know how I can go about this so as to be given an opportunity to attend an interview. I read that 60 day challenge is extended until 31st March 2015. Kindly clarify if the last day is the day before which one should have opted for the challenge or it would the last day of trading within the challenge period. In the later case if one completes 45 days by 31st March 2015, I presume his/her challenge will be incomplete. Hi I am using nse NOW app for trading. Can you please answer me below queries as I am facing problem. 3. Which option I have to select for buy today and sell after two days. I don’t use any leverage. Is their any option which enable me to buy and sell at anytime and any day. 2. Since you buy and sell using CNC, no need to convert. How many times can i take the 60 Day challenge? Only once or can be more than that? Will the last date 31st March 2015 be extended? as many times u want. 🙂 It is extended till June. can you please have more interviews with multiple 60 day challenge winners please, i see some have 5+ wins on various segments which is just brilliant & their insights would be very valuable for the traders community here and a great recognition for them as well, by the way all earlier interviews (especially Madan’s) were excellent and very useful for me. Will have something up soon. It helps normal traders like me to judge something. How many times can i participate in the challenge? once i finish the 1st can i take the 2nd challage n continue taking? Or will it stop once i win ir? You can continue taking, we have people who have won 6 challenges continuously. Still waiting for phone call from zerodha regarding refund brokerage and certificate. I completed 3 times 60 Day challenge. Two times failed last time become winner . April 2 i started again new challenge . But today i check my 60 day challenge page nothing found . including my new challenge position. so i started new one . what happened to my current challenge ? … waiting for Winner Certificate and refund brokerage of previous session . Congratulations on winning the challenge ! We see that your current challenge is active and has commenced on 2nd April. You’ll receive your Winner’s certificate and brokerage refund soon. We’ve intimated the concerned people who’ll check and revert. winners of 60 day challenge should be as per their decreasing order ie most time winners in first row in your winners page , at present they are in random order , and those who have won only one time in first row. We’ve forwarded your request to the concerned team who’ll evaluate and refund the brokerage. This will take upto 10 working days. Received refund. Certificate is not received. 60 day zerodha challenge Brokerage refund received . Thanks…..
Haven’t received my brokerage till now… i won my second challenge 2 months back but brokerage not refund till date… no response for mail also.. please refund ASAP. will today’s profit from trading will be considered under Day 1 (of 60 day challenge) ? No Lokesh, if you start challenge today, tomorrow will be considered as the first day. We don’t want to get into the a competition with other traders with real money. Getting aggressive could mean a trader risking his entire capital. Hi, Why Now a days Winners List are not getting updated..
Tanishq, have been held up in this rush of all the new launches. Have not been able to interact and write about our winners. 1) Can I fund/withdraw cash from my account during the 60- day challenge? Will it alter anything? Yes becky you can withdraw, it won’t alter anything. 60 day challenge is based on profitability of your trades in that period, ur account balance is not considered at all. Congrats, the physical certificate can take a couple of weeks, but you will have the online one soon. Faiz, trading on Indian exchanges is unlike trading binary options. You have to first open an NRI trading account, check this post. I am still awaiting my refund, online certificate and the physical one, id RK0774, I did click on refund more than 10 working days ago. Do I need to proactively call or email to anyone for certificates? Why now a days Very late response from Zerodha..
I’ve mistakenly activated the Currency trading for 60 day Challenge, Right now I trade only on EQ & FO. I haven’t activated my currency account, will it any chance affect my 60 day challenge of my EQ & FO. Is the challenge still open ? Yes, it is currently a continuous feature. Thanks a lot for the 60 day challenge, it really helped me to track my profits/loss day by day. Started trading with 1 lakh, I can see profit of 30 thousand in this 1 month only. No advisors, no tips…only following Trend & Charts. My 60 Day Challenge is going to finish today. 1. How many days does it usually take for the brokerage refund? 2. Is it transferred to our trading account or bank account? 3. Is this a continuous process? 3. Yep, continuous, u can start another challenge from tomorrow. I won the 60 Day challenge on 24th July, 15 after lot of conversations through mail Zerodha people refunded brokerage on 19th Aug but till today (02 Sept) I didn’t get Certificate of Winner and also a review form, which I supposed to get. Yep, in the next 10 days, the entire refunding brokerage will be automated without any manual intervention. Will check why you didn’t get a review form, but we have stopped sending out physical certificates for free. It was a huge operational hassle. We will send an e-certificate via email, if you want us to courier you the physical certificate it will cost Rs 500 including courier charges. You can send an email to [email protected] for that. Hi Nitin, my 60 says challenge completed on 17aug. but i don’t get refund till now. In your zerodha Q it would shown that brokerage refund will be processed within 10 working days. And yes your 60 Days challenge is really encouraging..
Abhineet your request will be processed at the earliest, you can verify the refund status on your back office ledger details. I won my first 60 Day Challenge. What is the procedure for obtaining the certificate and getting your name in the list of winners? You can login to Q, and click on 60 day challenge. You can put a request through there. You can send an email to [email protected] if you have any doubts. 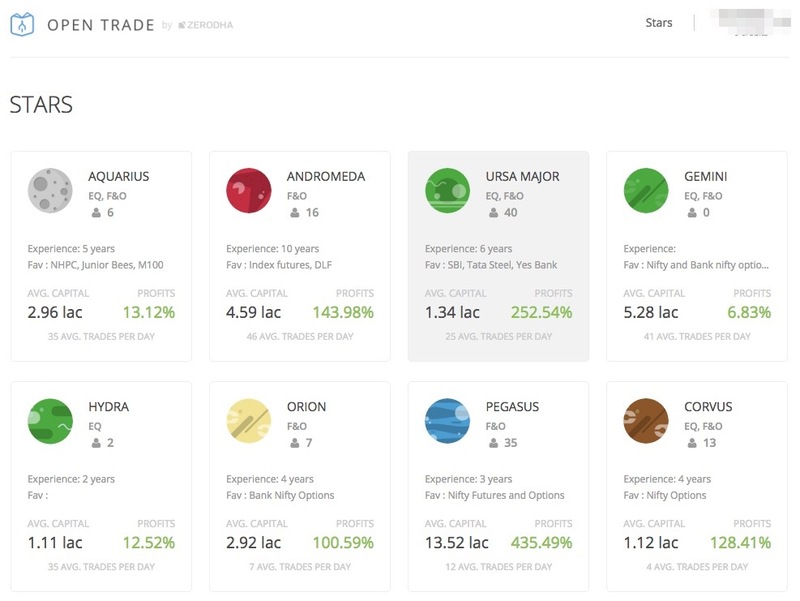 Also, I want to know more about commodity trading via zerodha, I understand there are no options only futures, so mainly want to know about the lot size, places where I can gather news (only trading equities). I do not see a lot of information in Z-connect in commodity section. Is there a email where I can ask specific Q’s Nithin? I have 2 queries regarding 60 day challenge. 2) Can same user participate multiple times before 60 day challenge ends on December 2015? Is 60 day challenge free or are you charging fee for this? Is it for intraday or for delivery also? There is no fee. If you win the challenge, the brokerage at end of 60 days gets refunded. Yep for all segments. HI, Its nice to read this page! Just i wish to know why the terminal some times hangs. Brokerage will be refund or not ???????? No, you needn’t make profit on all days. If you’ve made overall profit over the course of 60 days, you’re a winner and brokerage is refunded. In your example, brokerage will be refunded. Just wanted to know, i had started my 60days challange on 19th June 2015 & won, i click for refund but from last 20days it shows your refund will be processed with in 10 days. Plz let me know the processer for refund. Can you send an email to [email protected] with your client ID. Nice initiative. I account got activated yesterday and I dont have 60days to complete the challenge. Please make end of year as the last day to take challenge. Yes Vishwanatha, this is extended till April. Also once you start, irrespective of when it ends, u will get to complete the challenge. We don’t intend to make any money by charging you call and trade fee. Its a nominal fee of Rs.20/order which is to cover the costs of our agents that are hired to place your call and trade orders. I have started the challenge on 08/10/2015. 1. After that I have bought some equity shares which I do not intend to sell within next 2 months. In that case, will the closing price of those shares on the 60th day be considered for calculating 60 day profit/loss? 2. If I am in profit after 60 days, Is there any max limit of brokerage that can be claimed for refund? 1. Rajat, only the profits made of exited trades during the 60 day challenge is considered for profitability. If you continue to hold the share, that trade itself won’t be considered. 2. Yes, 30,000 is the max that we will refund. As as a regular at 60 day challenge, I think the feature of exited trades is beneficial to traders (customers), and perhaps a bit unfair for challenge. I do believe you should consider the stock/future/option closing rate at challenge or find a way to mark it at the initial stage as not for 60 day challenge). My point is say nearing the end of my challenge I am close enough say (days at 58/59 my loss just about 4-5 k), I can buy/sell both calls and puts (or buy nifty future sell bank nifty future) of an appropriate amount (for opposite direction). One of them will surely make money for me to win the challenge. Even if i loose a little bit in the other trade (net effect will mostly not be much and I will win back the challenge amount which can potentially be up to 30k). I surely believe in Rajat’s like case it should be allowed to buy shares for long term but that should be marked at the start of taking the position as not for challenge. I think previously we used to count open positions and have changed that in last couple of months. i also like to see my actual’s (including notional profit/loss) in my 60 day challenge rather than completed. I understand that one cannot trade for 2 or 3 days and claim as challenge winner. But one may not be taking trades on all days and, say, if we take trade in every alternate trading day it will be 30 trades. So how many trades has to be taken in 60 days to be eligible for the result? any minimum number of trades? No minimum trades. Even if you make one trade in the whole challenge period and are profitable, the brokerage will be reversed. Thanks for the Zerodha 60 day challenge. I have below queries. 1. Is the challenge extended till April 2016? I heard from my friend but cannot see anywhere, Can u pls confirm? If yes, can I start challenge even on last day and still use the benefit? 2. The usage of only realized profit is good. This would help us to strategize on last day for those who are on border. 🙂 This will also improve discipline and help us realize profits than wait for greed. One small suggestion. If someone wants to check even unrealized, then an option can be kept before the 60 day challenge if we want to consider unrealized as well. Thanks for keeping up the good work. Hope zerodha challenge will continue forever and not stop in 2016. I referred my friends tempting about this challenge only. 🙂 If it hits your profit, probably can reduce the bounty to half brokerage or so!!! Will have it checked and published if not already done. Suddenly, today when I have only 4 days left, my unrealized loss is added in my Zerodha challenge. We were told only realized will be considered and that’s the reason I did not sq off my position which is in loss. Can you please look into it asap? Phani, in case of F&O both realized and unrealized return are taken to determine profitability, that is how it has been from the last 2 years of us running the challenge. If you have open positions the starting day, it is MTM’d to the previous day and all open positions are then MTM’d to the last day. Getting it Checked if it was showing differently on your individual account. I would like to interview for the Zerodha Prop Desk. What do I have to do to be given this opportunity? Is this challenge time over or not. “This would be a limited period offer, which we will run until December 31st, 2015 and we would be hoping to add many more clients during this period to negate the revenue outgo during the course of the year”. Challenge has been extended till March 31st, 2016. Good luck! 1. What if I can’t trade continuously 60 trading days? There can have 3 to 4 days I can’t trade for personal reasons/ other obligations. 2. How the refund will be adjusted? Tapas, it doesn’t matter, 60-day challenge does not mean you have to trade all 60 days. If your portfolio is in profit after 60 working days after commencement of challenge, then you are entitled for a brokerage refund.However, max refund is Rs.30,000, algo traders and institutional trader are not entitled for refund. 1. You need not trade for all 60 trading days. 2. Refund will be for the brokerage generated for 60 trading days from when you start. The start button is not visible to start the challenge. Tried in IE and chrome. Both doesn’t display. Please help. If i will be buying a stock future contract, since i think that the stock may go down, hence i hedge the stock by buying put option. Suppose if my stock which i bought @ 1500 and the other day i see the stock gapped down to 500, and i bought my put option at 1200. Would i be in loss or would i be in hedged? You would be in loss until you sell your option position. Notional gain in options won’t really be considered for MTM loss on futures. Margin requirement for your position will drop significantly though because you hold the put options. Yes positional trader also considered for 60 day challenge. Starting April 1st, we have decided not to do any brokerage refunds on 60 day challenge. In the last message, it was mentioned brokerage refunds will not be done after 1st April. But in the main post it was mentioned refunds upto 6000 can be claimed. Is brokerage reversal for 60 day challenge winner still active? Yes by popular request, we have decided to extend the challenge. and is there a cap on the brokerage refund? is that amount 6000/- or is it unchanged at 30,000/-? Yes the cap for all challenges started from April 1st 2016 is Rs 6000. It is my first challenge. My start date is 10-Mar-16 and estimated end date 08-June-16. after completing this How many times i can take this 60 day challenge. I would like this 60 day challenge to continue forever. Participating in this challenge makes me to win every time and forces me to trade better. But i really dont mind if Zerodha cancels the brokerage refund completely. I started trading with Zerodha from Jan 2016 and won my first challenge. And i am doing pretty well for the second time. Thanks a ton for you guys to come up with this. As i said earlier , i dont mind forfeiting my brokerage refund. But keep this challenge forever. Hi nithin my name is omprakash. Id. DO0042.Regular trader for zerodha.Had some query on 60 day challenge.once I activated this challenge day for ex. In 60 day’s making profit for 45 days remaining 15 days loss but at the end of 60 day’s Iam in profit will it be considered. my brokerage will be refunded? Profit means realised profit or net realised profit. This challenge is for temporary or permanent? Yep, at the end of 60 trading days, if you are profitable the brokerage is refunded. Net profitable, so after all charges and all. Sir, I have exp of 2 years and will be opening an account with Zerodha soon. 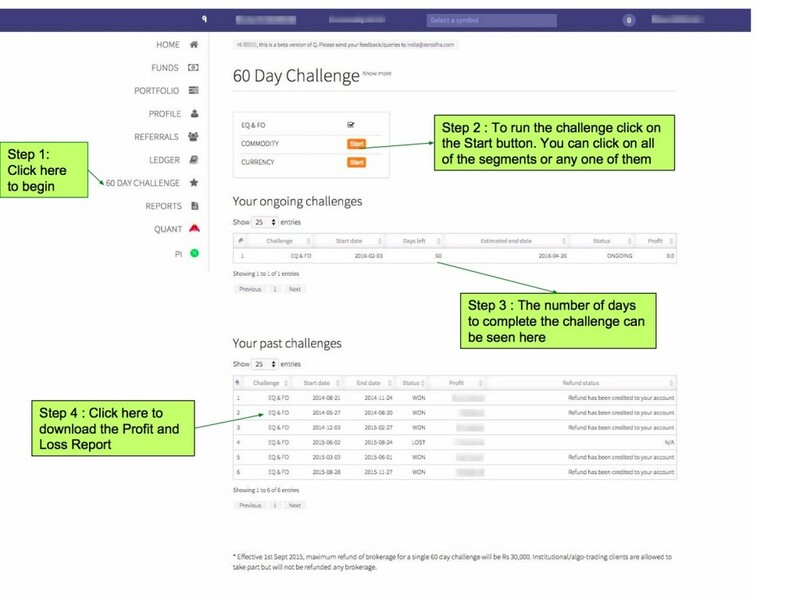 My query is “Do I have to trade every single day for the 60 trading days to be considered having completed the challenge because that is what the support person was telling me”. And what are charges for option trading “Is it 0.01% or 20rs, the lower of both” or “flat Rs. 20”. No need to trade every single day. It is 0.01% of the contract value or Rs 20 whichever is lower. Since options contract is all above Rs 2lks, so brokerage is a flat Rs 20. 1) Why does it take 10-15 working days to refund brokerage? Is there any screening done over the trades I had done? 2) At end of financial year, refunded money will be considered as profit to which I need to pay the tax? 3) How many times do I need to win 60 day challenge to participate in Zerodha interview? Is it based ROI, capital, risk trades? 4) To qualify in opentrade, still the requirements are not clear. What type of traders will be in opentrade? There are more winners in webpage, but few are in OpenTrade. 5) How do you come to know how much risk I am taking? By looking at the trade book or talking to me in interview? I am really happy with Trading in Zerodha. Thanks Nithin. I am bit concerned about max refund policy Rs 6000 for 60 day as I do more trades everyday. It looks like 5 trades (100 per day) free per day if I am going to be the winner :). 1. This is currently a manual process, also since brokerage is already collected there are some accountancy issues also that take time. 2. You can show this brokerage as refund, so your cost reduces. 3. A few times, currently haven’t been able to do any interviews. 4. You can send a request to opentrade.in, we will see if you qualify or not and let you know. 5. Talking to you during interview and corroborating it with your trade details. 🙂 we have to run a business right. is there any charges for entering in 60day challenge ??? or it is free for zerodha account holder? Free, no charges at all. It is 60 trading days, so around 3 months. Can you please clarify what do you mean by “actively trading” in statement as quoted below? Does that mean I have to buy/sell every business day? AH no such conditions. You can do 1 trade and get a brokerage refund. I am trying to start the 60 day challenge again. but I am not able to renew/start the challenge again. Th e challenge got started for commodity and equity. but the challenge is not starting for currency. I’ve mistakenly activated the 60 day Challenge for EQ & FO.. how do i unsubscribe it? I got enrolled into the 60 day challenge mistakenly. Can I cancel the challenge? is there any cost involved during the challenge if I don’t participate after enrollment? Hey Akash, there are no charges, you can rest easy. 1) How many times can I take the 60 days challenge? 2) Are there any monetary perks of being a star trader? 1. As many times as you want. 2. 50% of subscription amount. Hello Nithin Sir you have mentioned, you can take 60 days challenge n number of times and what is the meaning of “50% of subscription” ?? Yeah, you can start a 60 day challenge, finish it and take another. No limit. Have you checked out opentrade.in? This answer is pertaining that. Stars on opentrade get 50% of subscription amount. Amazing Idea !!! i’ve seen Many Sites / Companies .. But Zerodha is Totally Different .. The Secret of Success Of this Company is its CEO Mr . Nithin .. I’ve Never seen a CEO interacting with his Customers Like This ! I’ve Earlier Traded With HDFC Sec ..Sadly their Heavy Brokerage ate Most of My Profits . Already Applied for New Trading / Demat Account to Trade / Invest Via Zerodha . 60 day challenge winner page is not updated now. I did not receive my last challenge certificate. when will it get updated? when are you going to publish new set of stars in opentrade? I got an email that I had been shortlisted. New stars by tomorrow. 60 day challenge page/certificate will probably take a little longer. Some issues with the old page. Did u get the certificate ? By email or through Q ? Great to see Zerodha, under your able leadership, coming up with new initiatives that help customers. In US one has trading championships which run over months and many successful traders, like Larr Williams, Marty Schwartz etc, have used it to successfully catapult themselves. Have you considered something on those lines where people start with maybe 10 lac money points (fake money) which can be used in a simulated environment but with real time quotes and execution ability. It could also be linked to their Zerodha account, if so chosen, so that they do not have to place trades separately. Also it could be either free or for participation one needs to purchase credit points. The top 3 winners at the end of the stipulated price period can be given a purse and can be included on Open Trade as stars. Best wishes to you and your team for future successes. Demo platform is something we are working on. In 60 day challenge, maximum brokrage refund is 6000. If my brokrage is more then 6000 then i get 6000 or not? Yes, you’ll get Rs.6000 back if you’ve paid more than 6000 and have won the challenge. Sir, how many days does it take to receive Winner’s certificate and brokerage reversal ? Brokerage reversal will happen within 10 days. You’ll soon be able to download the winner’s certificate from Q. How soon Sir ? 30 days have past. how many more ? what is the minimum amount profitability to be declared as winner ? I mean what if i only made 1 RS @ the end of 60 day challenge in equity ? I do not see the winner page right now. Any work going in winner page? how much time it takes to get it online? I have won 60 day challenge 3 times and going to win 1 more time continuously. My name is also short listed in opentrade. What is the eligibility and criteria to get participated in pro trading? Like time period and return expectation? If my profile needs to get published in main page of 60 day challenge winner (http://zerodha.com/z-connect/category/zerodha-60-day-challenge/winners), what is the criteria? Do I need to win more 5 times consistently with good return? I did not get certificate for my recent 60 challenge win. We are working on a new winners page and certificate. You will get it soon. To get featured, yeah you need to have like a track record of atleast 1 year with us. I ahve won the 60 days challenge but certificate is not sent to me on my registered email id . When I mail to Zerodha , one of the executives said certificates will only be provided only if brokerage exceeds Rs.100.But in my case brokerage does not exceed Rs.100 . If anyone do not get certificate then what’s the need of playing 60 days challenge ? Raju, there is effort involved in sending those certificates, hence we have that limit. Sending it to only active traders. Is the cap of 6000 rs is per challwnge or overall? Happy new year. Sixty day winners page is not opening for last 2 to 3 months. Is it completely removed from zerodha? or can we expect soon. I am seeing one cute ☺kid photo in that page. Ah :), we are supposed to bring it back, just that we have been caught up in too many other things which are of higher priority. You can let it run, there is no deactivate option on this. if I make Rs.1 profit after 60 days paid all other charges & taxes. my brokerage will be refundable ? I won the 60 day challenge on 23 mar 2017. But till now (10 apr 2017), I have not got my brokerage refund. Why? It takes us a few weeks to process refunds. Plz update the time limit on ‘kite’. On ‘kite’ it is mentioned that within 10 days refund will be credited. My Total Profit is showing less than what i have actually made – Are the withdrawals also being taken into picture. Is there a payin / payout report ? No, withdrawals aren’t being considered while computing p&l. There’s no separate payin/payout report as such. You can download the ledger into excel and sort it to determine payout/payins. I sold an equity from my holdings during 60 day challenge. I had bought it before the start of challenge from secondary market. Will the profit be part of my challenge P&L? No, only such trades where the buy & sell happens during the course of the challenge will be considered for the 60 day challenge. Thanks. Is the same followed for derivatives as well? Suppose I buy an option and sell it during the period of next ’60 day challenge’; then any profit or loss resulting due to this trade shall not be counted. Pls confirm. For Options, the closing price of the option 1 day prior to the challenge is considered to determine whether or not you’ve made a profit on the option you’ve sold. I am using 60 day challenage, currently I am in profit and 1 day left (25th April) for ending my 60 day challenge. my question is that if I bought position today then do I mandatory need to close the position on 25th April ? Myt position is selling of call and put options ? how profit /loss would be calculated for this trade if I don’t exit it before challenge ends ? Example, if I have sell call option of Banknifty @ 78 rupees and if Monday closing price of this would be 40 rs and I decided to continue this trade for Tuesday , however my challenge ends on Monday then how this trade would be calculated in profit/loss statement ? You dont’ have to sell this position. P&L of only your exited trades are considered for the challenge. i have referred more than 300+ clients by speaking about 60 day challenge and they are all active traders and interesting thing is that, they are also referring more clients by saying only about 60 day challenge so, definitely 60 day challenge will brings more clients by upcoming years. In short is that at the end of 60th day the P&L should be positive. It’s just a good business strategy. In fact pocketing all the profit, Zerodha is happy to share it with clients and in turns they could able to increase client base because of mouth publicity. don’t discontinue this 60 day challenge, most of the clients opened the account for this only so ZERODHA may get bad name in future. All the best Zerodha team. 60 day challenge with all my heart say they are successful because they genuinely care for all their customers. Have seen this since I’ve know them.This made clients to refer others from 25,000 customers in 2014 to 2,30,000+ customers as of Feb 2017.
sir, currently i am trading in angel broking but i need to open account with zerodha for the 60 day challenge so my doubt is will you definitely refund the brokerage after getting profit and how many days it takes to refund. Today is my last day of 60 days challenge and I am in profit of around 65000. But when I am trying to open the page, one pop up comes and page is not opening properly. My name is Devang Rachchh, I won 60 day challenge which was completed on 26th April, I was supposed to get brokerage refund in 10 days from challenge complete. However, I have still not received amount in my account, may i know the reason and let me know when can I get refund amount in my account? My client id is RD0859. in backoffice in that 60 day challenge days were not changed for past 5 days. We are looking into your issue and it will be resolved at the earliest. My 60 days challenge page is showing different profit from the P&L report for the challenge. The P&L report value matches that from the ledger as well. Where and how to report the discrepancy? You can email [email protected]. THe 60 day P&L calculates only completed trades between the time period. Normal P&L includes positions that were held from before that got exited. It’s wonderful trading with Zerodha since last year, you guys are doing a great job! I just wanted to know that how much funds are refunded for every Rupees 1000 profit we make? or some percentage of profit that is refunded? I want to know, Is this offer still open for users? I just started trading in Zerodha, If this offer is still available I want to participate in this contest. Yes it is, login to Q.zerodha.com and click on start challenge. Your certificate will take upto 24 hours for it to be generated. Thank you for your patience. I’ve escalated this to the concerned, we’ll have this sent if it’s not already sent. I see that Star Trader : Carina, has an average Capital of 5.41lac(from 01-02-2106) and profit percentage of 185.39%. Can you please explain how Average Capital and Profit Percentage is calculated for a given period of time(explanation for a period of 3 days will clarify my doubt). How often is the Overview chart updated for a star trader(I see that the trader(Carina) has traded today(29-Aug-2017) but the chart is only updated until 24-Aug-2017)? Is it Weekly once? I have checked Carina’s Trade history. I found that after calculating the P/L for a day(08-Aug-2017) where only futures were traded(considering Trader traded with only one lot of the instrument), the P/L doesn’t match with the overview P/L. Am I missing some parameter in this case? Are NRI’s trading through NRE trading account eligible for the brokerage refund? I hope I’m not repeating a question previously answered – a quick search didn’t show any hits. No Hamish, applicable only for resident trading accounts. Support NRI customers involves a lot more resources than resident accounts. I’m unable to start Zerodha 60 day challenge. What should I do? It keeps showing — Connection timed out. Please refresh the page. 3. if i am in profit at the end of the challege..how could i know i have been displayed in opentrade. and what are the terms and conditions to get displayed there…. is it like u have to be in net profit above specific percentage? or is it on turnover? After paper trading, next step is actual trading. So thank you Zerodha for providing this contest and giving us tools and lowest brokerage structure. I just want to confirm that there is no minimum capital / fund requirement in contest. Yes, you’re right. No such requirements whatsoever. If I am profitable in F&O and loss in Equity segment in 60 days challenge ( Vice varsa also in F&O and equity) but overall Profit after combining both then I am eligible for winner of 60 day challenge and refund. Please explain this statement ! What does it mean? Do I have to pay Rs 6000 fee for participating in 60 day challenge ? ah no :). This means that if you have paid us 10000 in brokerage in 3 months of trading, only 6000 will be given back. Btw, if you are trading equity stocks for delivery, there is no brokerage you pay and hence no refund. i have one concern here. i trade in cnc equity delivery regularly. in equity delivery we have zero brokerage. for, 60 days challenge certificate issue condition is brokerage should be minimum 100.
if i am equity delivery trader, how can i generate 100 rs. brokerage? Harshlal, that’s the requirement I’m afraid. shall we get winners cerificate if we do only equity delivery trading? To get a certificate there is no minimum brokerage requirement. Q1)Suppose i made a net profit (here, net profit) of only Rs.100 or more on 60th day. Then what it would be considered “won”or “lost”? Q2)In case of won, suppose i spent the brokerage(excluding taxes) of Rs. 2000 in 60days and i m also in profit then how much brokerage amount I’ll get refund? Q : I have won the challenge in the commodity section. I have also activated the process for refund on q.zerodha.com, last month. I haven’t received the refund as yet. The Refund status still displays “Your refund will be processed within 10 working days”. Im sure it been well over 20 Working days from my request. Why is it taking so long??? Will it be actually refunded? Hey Mini. We’re in the process of upgrading our backoffice platform to ensure such delays don’t happen. In the meanwhile, can you please write to winner[at]zerodha.com with your issue? The team will have this resolved ASAP. If I buy and sell a share in the same day by CNC (not MIS) and gets my profit.Will it be considered as profit for a day for 60 day challege. Yes, profits will be considered for the 60-day challenge. Is prfit or loss fron ETF like nifty etf or BHARATIWIN included in this challenge? Whether BTST profit is considered or not for 60 day challenge? If I buy a share and hold that for say 10 days and then sell that share ,but buying and selling dates are within the 60 day challenge.So,in that case whether profits will be counted for 60 day challenge? I have won the 60 days challenge on 4th dec, 2017 but still (27th Dec, 2017) I didn’t get the price money. Please do the the needful. Can you write to winner[at]zerodha.com? I Have participated in 60 days challenge which completed on 13th Dec but didnt get the refund yet inspite of winning the challenge..Pls look into this matter. I have one query. If my 60 days completed and i failed to win the challenge ,then after how many days i could start again the challenge. There are many companies where the whole business model is based on profitable trading/investments, Futures First is a great example. From what I can observe Zerodha stands in a great position to start such a business initiative. You have winners of 60 day trading challenge, You have star traders, You have surplus revenues (from what I know), you already have an incubator which is promoting mind boggling start up ideas. All of this puts you in drivers seat to start such a venture. You just need to create a pool of funds and get the shortlisted traders on roll, you can can have lucrative profit sharing deal with these traders. Availability of additional funds will attract shortlisted traders while profit sharing mechanism will increase your revenues. Not just this, you will also create an unprecedented level of healthy competition within your active clients as they would definitely thrive to be a part of Zerodha team while earning additional money. If everything goes on well then this would lead to even more word of mouth marketing for you then the 60 day trading challenge. P.S. – Please ignore this idea if it goes against any compliance requirements which I may not be aware of at the moment. If you do give it a serious thought then feel free to reach out. Manvendra, this is indeed problematic to achieve from the compliance point of view. I didnt received my brokerage refund of 60 day challenge yet. I also didnt receive my brokerage refund of 60 day challenge yet. Hey Satish, can you write to winner[at]zerodha.com? Will have this checked. how to stop 60 day challange , by mistake it was click. how to stop 60 day challenge , by mistake it was click. Hi i am unable to see start point. Could you be clearer Dinesh? I can’t see the details of 60 day challenge in by back office (q). Although all three segments are checked, I cant see any further details. Hey Kshitij, if this happens, please try after a while. Possible you were trying to check when a back-end process was being run. I am also facing the same issue for the last 6 months. I tried the challenge two or three year back, is that the reason? can i reset it? Is it only for MIS or CNC is also considered for 60 days challenge. Both are considered, provided your CNC position is squared off before the end of the 60 day period. 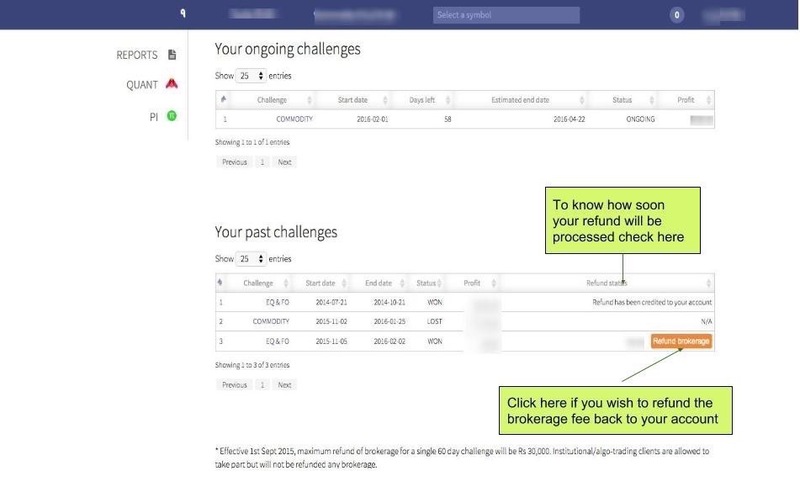 Once the challenge ends, you’ll see an option to claim the refund for the period. Once you click on it, the refund should be processed within 10 working days. I won the 60-day challenge in commodities segment and it has been more than 16 days. I haven’t received my brokerage back. UNFORTUNATELY I CLICKED EQ & FO START BUTTON. HOW SHOULD I CANCEL IT? AM NEW TO THIS TRADING. WHAT HAPPENS IF I START THE CHALLENGE AND NOT GET PROFIT AFTER 60 DAYS PERIOD. I’m afraid you can’t cancel it as such. Nothing to worry about though. You only have to gain from this. If you are profitable after 60 days, your brokerage is refunded, else it’s not. After account opening, I can add the fund. but unable to access withdraw site – https://q.zerodha.com/ to start the challenge. when login it’s takes me to https://q.zerodha.com/ site and if click Login with Kite i am redirecting to same page (https://q.zerodha.com/). Zerodha 60 days challenge profit is not getting update from last 2-3 days. Today I got reply from your team against my query regarding 60 days challenge error.Even though my net realised profit is +ve. it is showing as lost in status. Your representative has replied that Zerodha has calculated both realised and unrealised profit/loss to conclude the result. But as per your previous replies against queries the unrealised profit/loss will not be considered.How could you consider a trade as loosing trade until I have not exited from it.I have already sent a mail to Zerodha support team regarding same. Please revert and do the needful. how many time we can participate in the 60 days challenge.means if i loss the challenge for the first time then is it possible to participate another time and how many time we can do like that. Why you have stopped brokerage refund? The exchange doesn’t really encourage such schemes where brokerage is refunded, hence the decision to stop the refunds. Had won the 60 day Challenge in Feb 2018, refund not yet received!? I understand the 60 day challenge brokerage refund has been discontinued as of April. However, why is the brokerage not being refunded for challenges that ended in December for example. My 60 day challenge ended in Dec 2017 and it has still not been paid out. Customer service gave me some story about a back end migration and no ETA on when the brokerage will be refunded. I still dont have the refund. It has been 5 months. And in the meantime there has been another 60 that I won and that ended before April 25. No refund for that either. I can understand stopping of the challenge as of a particular date, but not paying refunds for prior challenges won doesn’t seem right. Hey Vivek, as you said, we’re revamping our backoffice. The new backoffice is currently being built to process trades, holdings, etc.,. Once the critical bits are done, we’ll finish the refunds bit and process these. I entered the 60 day challenge on Feb 23, 2018, and at the time it was mentioned that the brokerage up to 6000 rupees will be reversed if someone successfully completed the challenge; honestly, that was the only reason I started the challenge. But this policy seems to have changed since April 25th! Does this mean if I successfully complete the challenge I will not receive a refund of brokerage, even though I started the challenge before this policy change??? You will get refund. Those who started after 25th April, they won’t get. In my account, it says the challenge has 5 more days left, but the tentative end date is 17th May (today). Is this as an error of some kind? If there are 5 more days left then the end date should be 24th May. The tentative date is calculated when you start the challenge, the holidays aren’t taken into account. Hence ‘Tentative’. I observed that the challenge is considering unrealized profits of my options. Why? Isn’t it supposed to consider only the realized profit – I mean, shouldn’t it consider the value only after I have sold my options? My Challenge is about to end today and I am anxious to know the answer for this. Could you please give me more information regarding this? Before taking the challenge, I have some equity holding which were bought through the ‘Smallcases’. I may rebalance those Smallcases on 31st May 2018. So, I need to close some existing stocks, and need to buy some new stocks during the 60-Day challenge. After that rebalance, the next rebalance will be at the end of Aug. Hence, I may have someopen positions (equity holding) for all those stocks at the end of 60-day challenge. So, how my existing equity exposure and further rebalances will be counted for the purpose of the 60Day challenge? How will be the calculation done for the stocks that are bought before the commencement of the 60-day challenge and sold after the commencement of the 60day challenge? How will be the calculation done for the stocks that are bought after the commencement of the 60-day challenge and not sold until the end of the 60day challenge? By completely removing the refund , Retail investors doesn’t sense the reward by participating and wont keep them motivated.. I understand that it is an extra burden with minimal margin in Brokerage business. To keep retail investors motivated, you could reduce the max brokerage to 2k for 60days or make it 5k for 365 day challenge. There by reducing the outflow from you and also reduce the number of instance by making it 365 day challenge.. Please give it a thought..It will surely keep retail investors motivated for disciplined trading..
Hey. The reason for stopping this wasn’t the revenue, but compliance. The exchanges don’t encourage any schemes/offers like this. I have won 60 days challenge but I have not received broackage refund yet. My ID YJ3611. Ajay, if you started the challenge before 25th April, the refund will be processed in the coming weeks. We are currently moving our back office and this will be processed once it is complete. Awesome blog its very useful information, Thank you for sharing with us. I am not able to start Q-back office (showing you are not synced). And also I am not able t add fund in commodity a drop down menu of commodity is not active. Is there any fees charge for 60 days challenge?… reason is that when I click the start challenge option. …then display charge of 1500 + amount…. I wanted to know what the 60 day challenge is, so I clicked on ‘Start 60 day challenge’. Afterwards, the next screen displays charges of Rs. 13.69. Now there’s no option to deactivate it. Why weren’t these charges shown before starting the challenge? Or even on an intermediate confirmation page? I wanted to know what the 60 day challenge is, so I clicked on ‘Start 60 day challenge’. Afterwards, the next screen displays charges of Rs. 56.00 change. Now there’s no option to deactivate it. Why weren’t these charges shown before starting the challenge? Or even on an intermediate confirmation page? Please deactivate and cancel… pls refund is charged…. Hey! There’s no charge for the 60-day challenge. What you see is probably the total charges paid during the challenge period. Firstly ,thank you so much for the wonderful platform and starting this discount brokerage concept.You blogs are really helpful. I want to know till what limit the brokerage will be waived off. (The upper limit). I do numerous trades in a day (average 40-50). Also,is there a rank of traders who are most profitable or just WIN and LOOSE status. Can you tell what is considered to be ideal return for a 1 lakh trading account size in 60 days. (since you have an expertise in field).